Since I began reviewing manga over a year ago, I’ve come across some really astounding stories that are brand new to American readers, like Twin Spica and Saturn Apartments . There are also current manga that I loved beforehand: Yotsuba&! , Fullmetal Alchemist , Ouran High School Host Club . With all of these books coming out, you’d think I’d have more than enough Japanese comics to read. Of course that’s not the case. Even with so many great books to buy and read, there are still plenty others that I want that require a bit more digging. I started reading manga in high school, when the big “manga boom” was happening. With so many great comics coming out at once, it’s no wonder I missed the boat on some gems – great manga that I never bought, and have since gone out of print. I’m trying to rectify that now, looking through dealer’s rooms, used bookstores, and sometimes online. 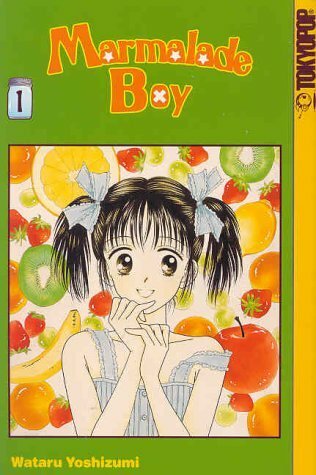 Marmalade Boy : a manga about wife-swapping! Miki finds out her parents are getting divorced, and switching partners with another couple. Added to that, she has to move into the same house as these two pairs and their son, Yuu. She hates Yuu at first – he’s a jerk, and isn’t even on her side as far as thinking the whole situation is insane – but true to shojo manga form she begins to fall for him. I’ve read the whole manga from the library before, so I know the whole story. There are so many intersecting love triangles that it turns into a web, and I would need a pad of paper and a chart to map the whole thing out. But I love it, and can’t wait to fill it out. Volumes needed to finish: 1, 5. Kodocha – the child star. Sana is a famous child actor, but her school life is a disaster thanks to Akito, who leads the boys in bullying the girls and terrorizing the teacher. As Sana faces off against him, we learn that his life is far from perfect, and as the two get closer we discover that Sana holds some family secrets. I always liked the way this series handled a child’s perception of love, as Sana thinks she’s madly in love with her agent, Rei, and hasn’t an inkling about what Akito feels for her. I had borrowed volumes from a friend, but never got to finish the story; it’s been haunting me, but now I’m almost done. Volumes needed to finish: 4, 8. Gals! Now here is a manga that is just fun. Kotobuki Ran is the “queen of Shibuya”, a trendy district in Tokyo. She fights bad guys, perverts, teachers and rivals, and shouts about having fun and that she’ll never stop being who she is. It’s a little unrealistic, and I certainly won’t call Ran a good role model, but it’s a breeze to read. Volumes needed to finish: 4, 7-10. There are other manga I’d like to collect: Peach Girl, if I can get over how angry it makes me, and Short Program, if I can find decently priced volumes that aren’t torn to bits. But those three are the ones I’m concentrating on now. Are there any out of print manga (or other books) that you try to hunt down? Or, since I’m always trying to increase my list, are there any you suggest? Aria (TP), High School Girls(One Comics) and Cyborg 009 (TP). I’ve got most of them but as they become rarer I’m forced to use eBay more and more. She is the one named Sailor Moon! I also started reading Miracle Girls which is OK.
I’ve heard of Miracle Girls… another magical girl shojo, right? And Kodansha’s rereleasing Sailor Moon, so I’m holding on until that happens. I should try that, the manga I want never seems to pop up on Bookmooch.